Although the Seahawks probably won’t narrow their options to merely five players, this quintet will almost certainly be on their radar on April 26th. Pete Carroll says he wants to improve the team’s pass rush and front seven – and that’s what he’s going to do this year. While many are still pinning their hopes on a big splash up the board to target the top two quarterbacks, there’s every chance a deal just won’t be possible even if the team wanted to make that move. More on that in tomorrow’s updated mock draft, but for now – let’s look at these five realistic options for the Seahawks, including one ‘non-defensive’ wild card. Regular visitors will know my own personal opinion on each of these prospects already, I’m just trying to offer a broader look in today’s piece. Perhaps Seattle’s preferred option? We’ve talked a lot about Upshaw in the last week and I maintain he will be extremely high on Seattle’s board. Upshaw shows elite recognition skills and he does a better job than most people think working in space. Despite lacking ideal length, he has a tremendous grasp of leverage and really attacks lineman with great pad level. He can beat you with a violent bull rush, but he’s also capable of keeping blocks away from his frame to dip around the edge and get to the quarterback. Although he gives up some speed and mobility to Melvin Ingram, his all round game is superior and worthy of genuine consideration in the top-12 picks. The Seahawks will be fortunate if he’s available for selection with their pick. A better speed rusher than Upshaw, but not quite as technically gifted or as polished against the run. Ingram owns a superb spin-move which he used to great effect at South Carolina and it should help him make plays early in his NFL career. He played running back in High School and it shows – he’s one of the best athletes on the Gamecock’s roster and flashed that potential on a stunning fake punt touchdown run during the season. There are legitimate concerns he’s a bit of a tweener, but with only limited pass-rushing options for the Seahawks this year, expect Ingram to be high on their board. His ability to move inside on passing downs or be used in a three-man front to get extra coverage will be a big bonus. I’m not a huge fan, but he appears to be a viable option. Melvin Ingram’s new best friend and a complete enigma so far in his career. Coples looked a class above at the Senior Bowl and completely dominated every opponent he came up against. Questions linger about his mediocre senior campaign that threatened to completely derail his draft stock, but the Seahawks have a Head Coach confident enough to take on a challenge like this. A motivated Coples could be one of the best pass rushers in the NFL, without doubt. There are some question marks about his run defense especially given Seattle’s defensive identity and he’d have to replace Red Bryant at end, so it’s a legitimate dilemma. While some teams will strike Coples off their board, it seems that won’t be the case in Seattle. Opinions are mixed on Brown, with some believing he has elite range and can make a quick impact in the NFL while others question his ability to provide any kind of pass rush and ask whether he’s big enough to warrant a top-pick. Aaron Curry proved size and speed are nothing without instinct or range – Brown has both in abundance. Although he’s never likely to be a productive sack artist, he will be a steady sideline-to-sideline tackler who makes enough plays during a season to warrant a first round pick. Although signing a pass rusher will be Seattle’s priority, Brown could come into play depending on how the board falls early. He’s certainly draftable for the Seahawks and could be set for a boost after the combine. Considering Tampa Bay’s recent appointment of Greg Schiano as Head Coach, there seems little chance Richardson will make it past the Buccaneer’s at #5 overall. He may not even get past the Browns at #4 and there’s a couple more teams picking before the Seahawks that would/should show interest in one of the draft’s elite talents. Richardson will be a star at the next level, particularly if he joins a team with an established ground attack like Seattle’s. Marshawn Lynch is likely to be retained – either via a multi-year deal or via the franchise tage – but running backs are always susceptible to short careers. The Seahawks offense is being built around a strong ground game, so getting an elite runner like Richardson could be too good to pass up. 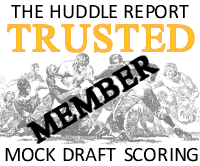 Tomorrow I will be updating my mock draft. I’ll be using the February 1st projection as a basis for comparison post-combine and pre-draft. On Thursday, we’ll break down tape of Kirk Cousins’ performance against Georgia in the Outback Bowl. Its not exactly a secret that the Seahawks are going to prioritize improving the pass rush this offseason. It’s been talked about so much, and yet there is one funny little detail that always gets left out: Seattle actually has 4 pretty good defensive line starters already. Red Bryant is perhaps the most unorthodox defensive end in the NFL, but for what he’s asked to do, he’s very effective. He’ll be 28 at the start of next season. There was a time near the end of the Tim Ruskell administration when a very compelling case could be made that Brandon Mebane was not just Seattle’s best defensive lineman, but the team’s best player period. He’ll be 27 at the start of next season. I know that some people are skeptical of Pro Football Focus and its metrics, but they loved Alan Branch last season- even naming Branch to their all-pro team at one point. Branch may not create a lot of pressure, but like Bryant, he does a lot of quiet things very well. He’ll be 27 at the start of next season. Chris Clemons has 22 sacks in 2 seasons since becoming a Seahawk, has stayed healthy, and hasn’t been destroyed against the run as many thought he would be. He’ll be 30 at the start of next season. Across the board, this is a group of above average players who are in their primes. So what’s the problem? The problem is that the Seahawks only sacked the quarterback 33 times. The Titans had the NFL’s second fewest sacks, and they had 28. So how did this happen? It happened because Seattle is (more or less) running a defense with a 3-4 styled defensive line and a 4-3 styled linebacking group. And since 3-4 defenses rely on linebackers to create pressure and 4-3 defenses rely on the front four for pressure, you end up with the worst of both worlds from a pass rushing standpoint. Out of the current front seven, only one player (Clemons) is counted on to consistently generate pressure. Our pass rush is kind of like the experience of finishing off a loaf of bread to make a sandwich, then remembering that all you have left are the two crappy end pieces that no one ever wants to eat. Even if the bread normally tastes great, its not much fun eating a sandwich made with those two skinny end pieces. So what should the Seahawks do about it? As I see, it, they have three options. The first is to jettison Red Bryant and then acquire a more traditional 4-3 end. Red Bryant is a free agent, and has 2 sacks- in his career. Its hard to completely punt pass rush at one of the defensive end spots in a 4-3 and still hope to get pass rush results. That said, given that Seattle appeared to sign Alan Branch primarily as 5-tech depth, and given how much Bryant contributes to the defense outside of pass rush, I don’ t think Seattle is going to revert to a more traditional 4-3 any time soon. The second option is for Seattle to switch to a 3-4 defense. Seattle has the defensive line for it, and is probably looking at overhauling their linebacker group anyway. This isn’t the best draft for making a 3-4 conversion though. There are no obvious Clay Matthews / Shawne Merriman / DeMarcus Ware caliber rush linebackers for Seattle to target if they moved to a 3-4. It also seems unlikely because Pete Carroll is a defensive coach with strong ties to Monte Kiffin and a 4-3 scheme. The last option is to just stay the course with the Red Bryant defense, but this could be the most challenging option of the three if you actually want results. If the Seahawks want to be comfortably on the above average side of the league in pass rush, they’d need to add about ~10 sacks, and 10 sacks is a lot. If you can’t add those sacks from Red Bryant’s spot (or Mebane’s spot- he’s probably the team’s long term 1 tech), you’d need to add them from the LEO position, the 3 tech position, and the linebackers. Very few linebackers in a 4-3 scheme can be counted on to rack up sacks- so if Seattle wants to add sacks from the linebacking area, they will probably need to get creative about it. One possibility is drafting Courtney Upshaw and playing him as a bit of a hybrid Will linebacker/stand-up end. On pass rush downs you could have Upshaw line up outside of Bryant and create a look very similar to a 3-4 pass rush, while having Upshaw play a more traditional Will position on some other downs. The downside of this is that it would put a lot of extra stress on the other two linebackers, and while Hawthorne is a nice player, he isn’t exactly known for his ability to cover a lot of ground. It could expose Seattle’s defense to a greater risk of allowing a big play. I suspect the Seahawks will get creative in some such way, but that probably won’t be enough in itself to fix the pass rush, even if Clemons continues to produce or is replaced by someone else (Dexter Davis, etc) who matches that production. There really isn’t much way around it, Seattle needs to upgrade the pressure from its front four. And if they keep Bryant, the only place they can really accomplish that goal is the 3-tech defensive tackle position. As said before, Seattle isn’t exactly hurting at defensive tackle. Branch was a quality starter. Hargrove and McDonald combined to make for quality depth. If Seattle goes out and acquires a “run of the mill” 3 tech, its unlikely that he’d have much of an impact. The Seahawks have to be careful here- Branch’s contributions should not be overlooked- it really wouldn’t make sense to downgrade the defense as a whole just to add a handful of sacks. If the team is going to replace Branch, they must make sure they are actually upgrading the position, and that means either trading for an elite player, or rolling the dice on a player who could be elite. Seattle could try to draft a situational 3 tech pass rusher who plays only on pass rush downs, but one problem with that is that substitutions can be problematic against hurry up offenses- so if possible you would prefer your 3 tech pass rusher to be a 3 down lineman. And that’s the problem. Effective pass rushing defensive tackles who can play every down are one of the rarest finds in the NFL- its a big reason why you just about never see a 4-3 defense build a pass rush away from defensive end. Complicating matters further is that good pass rush defensive tackles are rarely a sure thing. Guys like Ndamukong Suh and Warren Sapp are a rare beast indeed. It goes without saying that you won’t find anything comparable to that in the 2012 draft, and maybe not for many years to come. Perhaps the best defensive tackle in this class is Michael Brockers, which is kind of funny since Brocker’s 2011 season looked an awful lot like Alan Branch’s. Brockers only registered 2 sacks in 14 games, but made up for it by being an exceptional all-purpose 3 tech. Brockers will not be a high pick this April because of those results though. He’ll be a high pick because of the results he could be posting in 2013 or 2014. Brockers hasn’t quite put it all together yet, but he’s a guy that could easily become an elite pass rushing defensive tackle if enough things break right. I don’t know if Quinton Coples can safely be classified as a 3 tech- he strikes me more as a Justin Tuck hybrid type. I’ve long been turned off by Coples lack of effort and inconsistency, but his senior bowl performance was illuminating and mind changing. Coples truly does have elite potential. Of that there is no longer any doubt. And for what its worth, Coples’ hype began in the first place from a splash debut as a 10 sack 3 tech in 2010 in relief of the suspended Marvin Austin. It would not shock me at all if Coples is drafted by a team with the intention of playing him at the 3 tech. 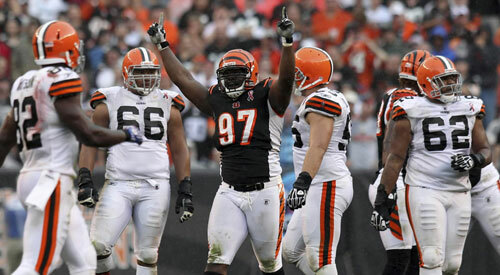 Two years ago, Geno Atkins dominated the senior bowl and hoped to elevate his stock. He ended up falling into the 4th round, but today he’s one of the more exciting young defensive tackles in the game. Interestingly enough, Atkins was a player that interested Seattle in the 2nd round of that draft, but they rated Golden Tate higher and never got a second shot at Atkins. While I don’t think anyone takes the senior bowl more seriously than the dozens of real games that preceded it over a prospect’s career, it can help remove doubts about raw ability. This is a game where almost every player is at or near NFL caliber while in a job interview type situation. They want to look their best. With coaches/GMs from every NFL franchise watching, the last thing they want is to have the guy across from them make them look bad. Dominating in that kind of situation should stand out. Atkins himself was a 4th rounder. Remember Rocky Bernard and his 8.5 sacks in 2005? He was a 5th round pick. Just because Seattle needs to make a splash doesn’t always mean that player has to be an early pick. Whether or not that kind of player can be found later in 2012 is yet to be seen. My favorite defensive player in this draft is probably Devon Still. And yet, I don’t think I’d draft him. Still could easily be Mebane 2.0- perhaps even better. The reason is because Still doesn’t really offer much hope as an elite pass rusher. He will collapse the pocket. He will occasionally shed blocks. But Alan Branch is already doing that to a lesser degree. Still is a very good player, but he might be redundant on this roster, a luxury pick in a draft where the Seahawks seem determined to avoid making a luxury pick early on. As a pass rusher, Still can’t offer the same raw potential that Coples or Brockers could provide, and for Seattle’s crazy defense that relies on so few areas to create pressure, its key that those areas produce, and produce big. John Schneider’s drafts so far have been risk averse at the top. In the first round, it doesn’t get much safer than drafting two offensive tackles and a safety. Would this front office be willing to take a chance with a high pick on Brockers or Coples? If addressing the pass rush through defensive tackle is their goal, and they want to make that investment this year, I would say they almost have to. Of course, the team will keep all options open, and I get the feeling they are leaning more towards defensive end than defensive tackle early, but wherever they end up addressing defensive tackle, I’m hoping for a player with as high a ceiling as possible, even if that player is a big risk. Quinton Coples was the best player on the field at the Senior Bowl. He looked like a ringer, hand plucked from the NFL to show prospective rookies how it’s done. He consistently beat his man off the edge, dipped inside, showed great hands to avoid blocks and the burst and explosion you’d expect given his physical potential. Yet rather than celebrate this display, we’re left asking why it wasn’t on show during the regular season. If he can play like this in what amounts to a job interview, why can’t he play like this on a standard week for North Carolina? If the background mess at North Carolina is largely responsible for Coples’ disappointing performances, should we expect the same if things aren’t going perfectly in the NFL? Is he going to stand up and be counted, or mail in the rest of the season if times are difficult? Will becoming a millionaire and first round pick be seen as ‘job done’ and does he have that burning desire to be great? If the light stays on in the NFL, you’re looking at a player with enough potential to match the best defensive ends in the league. He has the physical qualities, the same ability to dominate opponents and be that defining edge rusher of his generation. He’s probably also going to have indifferent weeks – but if he brings it most of the time, especially at key moments, and can provide consistent pressure – he’ll end up being a star at the next level. Part of me wants to buy into Coples. Is he a team player? Well he did switch positions in 2010 during UNC’s suspension crisis. With Marvin Austin, Robert Quinn and others missing the season, Coples dipped inside and did an admirable job. He moved back to end in 2011 and while his performance was largely disappointing, he’s not complained about the switch or used it as an excuse. He was often subbed in and out of games being spelled by Donte Paige-Moss, but appeared to get on with the job. 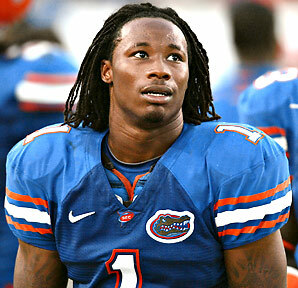 Coples also stuck around for his senior year when he would’ve likely been a first round pick in 2011. He took full advantage of his trip to Mobile to show scouts what he’s capable of. We saw in the Senior Bowl the way he keeps blockers guessing and flashes elite quickness from the snap. Coples kept hands away from his frame – he’s got long arms and used them well to avoid contact and lean around the edge. Although I don’t foresee any permanent future at the three-technique position, kicking him into the middle on third downs and obvious pass plays would allow you to put two edge rushers outside and consistently only need to rush 3-4 lineman adding numbers to your coverage. Coples is an elite athlete – the absolute benchmark physically for a defensive end. Yet if he’d played with the same fire as Da’Quan Bowers did in 2010, he probably would’ve had 15 sacks this season. I’ve highlighted tape against Miami, NC State, Clemson and Missouri below that really shows the great dilemma here. We’ve seen the best and worst of Quinton Coples in the last few months, so what will the millionaire professional version look like? Right now it’s hard to judge his stock. On pure potential he could still easily find a home in round one. Jacksonville needs a pass rusher, but missed recently on a similar physical talent in Derrick Harvey. Miami appears to be contemplating a switch to the 4-3, making Coples a more realistic proposition if he’s going to be viewed as an orthodox defensive end. Likewise Buffalo may also change to the 4-3 and are crying out for a pass rusher. All possible homes, but all with alternative needs and maybe lingering doubts about whether Coples will max out his potential. We’re talking about three franchises who can’t afford to trip up – two of which are breaking in new coaches. Will they play it safe and go for a more conservative pick, or try to hit the home run? What about the Seahawks? He’s not an obvious fit for Seattle’s scheme and replacing Chris Clemons – the team’s only pass rush threat in 2011 – shouldn’t be a priority this year. Clemons needs help, not an understudy. Coples could work at left end, but that would mean replacing Red Bryant, who appears likely to be re-signed while keeping his place among a big middle-three. I don’t think Coples can work permanently at the three-technique as mentioned before given his size and frame. Plus the Seahawks appear to making relatively safe picks in round one – solid players who will buy in and contribute quickly. Coples would be their riskiest project to date, but also potentially their most rewarding. I don’t think Seattle will draft Quinton Coples if he’s available, but like every other team in the NFL – they’ll have to try and work out whether he’s worth the gamble. Tape courtesy of Aaron Aloysius and JMPasq. To read our Senior Bowl write-up from yesterday, click here. Before I get into this write-up I want to highlight an article I wrote earlier this weekend breaking down possible three-technique option Devon Still. Check it out by clicking here. I’ve just finished watching the Senior Bowl and wanted to quickly put a few thoughts on the blog. Firstly, the best player on the field today was Quinton Coples (DE, North Carolina) and it wasn’t even close. He was playing at a different level to anyone else, flashing superb range, athleticism, repertoire and extreme athleticism. His motor kept rolling throughout the game and he played like a top-five pick – he was virtually unblockable at times. The thing is, I’m not quite sure what to make of it all. Throughout 2011 Coples flattered to deceive. He was regularly subbed in and out of plays, time-sharing with Donte Paige-Moss (who also had a disappointing year). Coples played without fire, without urgency. He claims he struggled to adjust back to right end having featured mostly inside during 2010, but he still should’ve been dominating average college lineman due to his natural physical talent. His senior season was just a completely wasted opportunity, it was garbage. He turns up in Mobile for what amounts to a public job-interview and performs at a level beyond anything we saw in college this season. NFL teams must be asking themselves tonight which Quinton Coples they’ll get if they take him with a high pick. This version can be an all-pro and rival probably only Julius Peppers for natural-born ability to rush the passer. The North Carolina version is going to be a lethargic non-factor who costs you a lot of wasted money and maybe a reputation. In many ways this performance raises more questions than answers. The team that ultimately drafts Coples will be left with the ultimate risk-reward situation. So which team, if any, will it be at the top of round one to take this on? That’s what we have to work out. But today was the Quinton Coples we wanted to see throughout 2011 and nobody can deny the potential he has at his disposal. Quinton – don’t waste that potential. Teammate Zach Brown also showed well at linebacker. He was quick to react to plays throughout, flashed good closing speed and an aggressive edge I’ve not seen before. Brown was making plays all over the field and while he’s never going to be an effective pass rusher or gap clogger, he’s going to have a solid career as a sideline-to-sideline linebacker. There were a couple of occasions were he could’ve made a big play in coverage but missed, yet you have to give him credit for being in position in the first place on developing routes. That’s tough for a linebacker at any size. Vinny Curry (DE, Marshall) capped off a nice week with another solid performance. He’s quite a unique player – lacking the really big size but being more of a physical rusher rather than relying on speed. He boosted his stock this week and with teams looking for pass rushers, he could easily work his way into the late first/early second round range. Courtney Upshaw (DE, Alabama) had a quiet evening but for a sack at the start of the second half and a splash on a Kellen Moore throw shortly after. 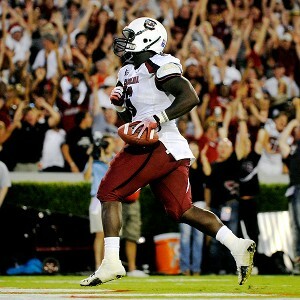 Melvin Ingram (DE, South Carolina) went a step further and was virtually anonymous. He does seem to have a new BFF in Quinton Coples though, the pair were inseparable all week and were constantly together on the sideline during the game. Despite a rough first series, Kellen Moore (QB, Boise State) made two excellent throws on his second drive only to be let down by bad drops. He’s still showing a slightly elongated release, but they were nice throws. We didn’t learn a great deal today from Moore, who was widely panned for his performance in work-outs during the week. At times his weak arm showed up as he made one or two ugly throws, including a near pick from a tipped pass (Coples) on his first attempt. We also saw some very accurate deliveries with adequate velocity when given time in the pocket. Twelve months ago I mocked Juron Criner (WR, Arizona) as a first round pick, before he opted to return to Arizona for his senior year. Overall he had a difficult 2011, but he reminded everyone today why he warranted such high praise a year ago. While there’s no AJ Green or Julio Jones in the class, there’s unique depth. Criner could be pushing his stock back into the high second round. The amount of depth at the position may put some teams off drafting Justin Blackmon in the top-ten, something we’ve discussed a lot recently on this blog. Teammate Nick Foles (QB, Arizona) looked like the player we’ve talked about all year. 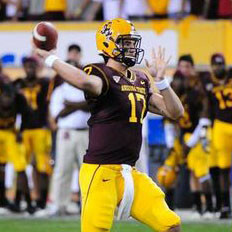 Away from Arizona’s high percentage scheme he looked out of rythm, he lacked mobility and struggled with pressure. He only seemed comfortable throwing to Juron Criner, the pair linked up for a touchdown. His footwork was generally poor, he looked uncomfortable getting out of the pocket and being asked to improvise beyond the play call. This week should act as a bucket of cold water to his stock, with some people strangely bumping him into first round consideration in the week leading up to the Senior Bowl despite a mediocre senior campaign. The two Arkansas receivers Jarius Wright and Joe Adams are going to make rosters in the league and provide excellent value. They’ll be two guys in a few years where people ask why they lasted so long on draft day. Exciting playmakers, top-end speed. Both will tear up the combine. Alameda Ta’amu (DT, Washington) had a really impressive game, flashing the kind of potential that at times had people considering if he could be a top-15 pick. He’s an ideal nose tackle, but moves well too and will offer some pass rush potential. He shouldn’t fall further than the first few picks in round two based on potential alone. Fellow Huskie Chris Polk also had a nice game after receiving criticism during the week for a modest performance during work-outs. Isiah Pead (RB, Cincinnati) probably took himself up a round or two today. He had back-to-back big runs on special teams and was awarded the game’s MVP. I’ve always liked Pead as a change of pace back and he’s going to have a lot of interest as a return man. 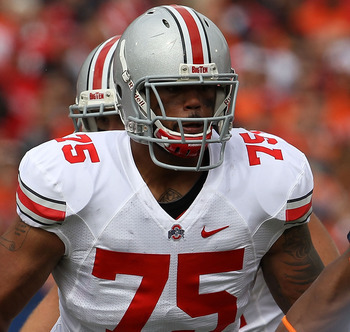 Mike Adams (OT, Ohio State) looked superb at left tackle competing against a high quality South defensive line. I’ve never been that high on Adams, but he looked good this week. I’ve not studied left tackles much this year because it’s probably the one position this team will NOT be drafting in round one. I’m happy to admit my brief initial impression of Adams may have been wrong and teams needing a blind-side blocker will have him high on their board. The Seahawks need as many offensive tackles to rise as possible, because potentially it will push some of the better defensive talent into their path at #11 or #12. Another Buckeye – DeVier Posey (WR, Ohio State) – did his best job to unsettle Kellen Moore and Kirk Cousins with bad drops and finishing routes poorly. Not a good display at all. Jamell Fleming (CB, Oklahoma) had a tremendous year for the Sooners and showed up big here, including an interception on Brandon Weeden (QB, Oklahoma State). He’s one to watch, he has a shot at a good career in the NFL. 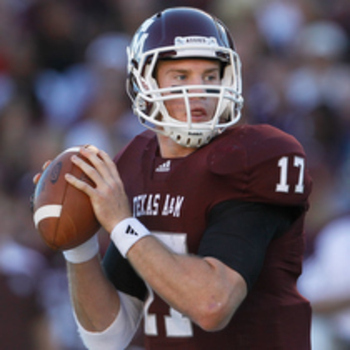 For what its worth, Weeden’s hype needs checking. That was a bad throw from someone who suddenly is being talked about as a possible first round pick. Weeden had two interceptions on the day – completing only three more passes to his own team. He is not going to be a first round pick. Kirk Cousins (QB, Michigan State) was perhaps the most impressive quarterback, but there’s very little positivity to take from the group today. Bobby Wagner (LB, Utah State) isn’t a spectacular player and I’ve not had much chance to scout him during 2011, but he was the second best defensive performer on the field today after Coples. Just a solid football player who will enjoy a solid career if today’s evidence is anything to go by. Fellow linebacker Sean Spence (LB, Miamia) had a quiet game but was highlighted by Mike Mayock as someone who ‘made money’ during the week. 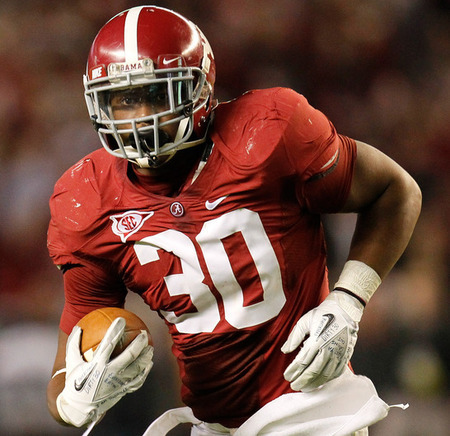 In my most recent mock draft, I projected Spence to Seattle in round one. Few players boosted their stock like Devon Still in 2011. Previously an inconsistent defensive tackle with sloppy technique, he dominated the Big-10 as a fifth year senior. He’s the most likely three-technique option for the Seahawks in round one this year – probably edging LSU’s Michael Brockers – and should leave the board within the top-20. Last year Still showed he was good at maintaining his position at the P.O.A. but he simply didn’t get enough penetration on a consistent basis. Too often that he was leaning into blocks and leading with the shoulder. You’ll see in the first video below (2010 tape vs Florida & Alabama) how he struggled with balance and spent far too much time on the turf. In the Florida tape at 5:10, as soon as he turns his right shoulder to the blocker he’s led to the ground and essentially tackled out of the play. This happened far too often last year and it’s good to see he’s made the necessary technical adjustments. He’s now a lot more square when attacking blockers and the results were obvious – 17 tackles for a loss in 2011. There also wasn’t much evidence of a club or swim and when he was engaged and struggling to shed a block, there’s rarely a counter. He really looked like a boom or bust type of guy – sometimes knifing the hole and causing a splash, but most of the time he’d be blocked out and have very little impact. The Seahawks don’t have explosive pass rushers among their interior line, but they have active tackles who eat space due to their size and play with a relentless nature. My concern was that Still wasn’t enough of an upgrade as a pass rusher to compensate a little on the run-defense. Clearly he made significant strides in 2011 as you can see in the second two videos (vs Illinois & Alabama). Still attacks the A and B gap relentlessly, exploding off the snap and exploiting any hesitation among the interior lineman. He’s very difficult to block when you’re not head on, and Still’s power and explosion to attack space on zone scheme’s flashed time and time again. He completely dominated Illinois from start to finish and gave Alabama’s offensive line more problems than any other opponent I saw in 2011. There’s better handwork on show, including an effective swim move to avoid blocks and work into the backfield. He consistently folds the pocket affording outside pressure on pass plays, but against the run he’s almost immovable and most of the time will maintain position to force runs outside. When I watched Penn State last year, they didn’t appear to blitz as much in the second half of the season -I put that down to Still’s influence. I spent some time considering whether he’d be a better fit in the 3-4 as a five technique. While I still think he can adjust to that role (and if San Diego are willing to consider Corey Liuget for that role, anything is possible), for me Still is more suited to playing at the three-technique. You want him abusing the A & B, he’ll perform best against a tackle with size who clogs the gap between the center and left guard drawing more than one block. Although Cleveland may be out of range at #22 (and may be concentrating on offense anyway) Still would be an ideal partner for last year’s first round pick Phil Taylor. That’s not to say he couldn’t find a home in Seattle alongside Brandon Mebane. Pete Carroll knows the value of a productive three technique – he nearly always had one at USC and it’s integral to this scheme. At the moment Seattle’s pressure comes almost exclusively from Chris Clemons and for the long term – finding a serviceable three-tech is surely second on the list of needs after franchise quarterback. Last year the Seahawks had Alan Branch playing the role, with Anthony Hargrove spelling on specific downs. The direction of the team’s defense could swing heavily on April 26th depending on who the Seahawks pick. A guy like Still would maintain the base 4-3 look and afford Seattle a penetrative interior force on standard downs. Keeping Branch and investing in an edge rusher such as Courtney Upshaw would move the team closer to a hybrid 3-4, maintaining size up front but relying on outside pressure. There are some things that he has to keep working on. Still has a tendency to play high and although I’ve not seen this as much in the 2011 tape, last year he appeared to be susceptible to cut blocks and didn’t protect his legs well at all. 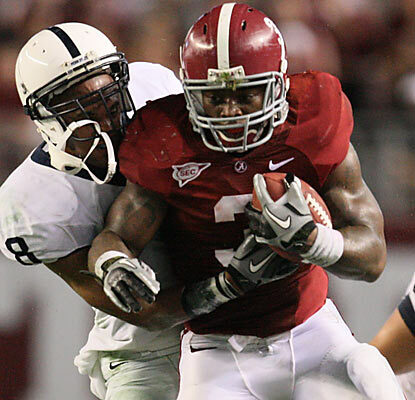 Against Alabama he was consistently cut to the ground – violently so by Trent Richardson on one play. I’d like to see him work to get bigger in the lower half of his body. Still is top heavy and will need greater power from his legs at the next level. He also doesn’t have much of a bubble and looks more like an oversized end than an interior rusher. Another slight concern is his injury history. While he’s fought back to enjoy three productive years as a red-shirt senior – he tore an ACL in 2007 and suffered a broken ankle in 2008. He mised two 2011 regular season games and also missed his final opportunity to appear for Penn State with a turf toe injury, a problem which also stopped him attending the Senior Bowl work-outs this week. Could he make it to Mobile? Maybe, it’s hard to tell how serious the injury is but many expected him to attend. If he is healthy enough to compete, it could be a missed opportunity to boost his stock. In terms of the other players available at this position in the past, Still grades lower than Liuget and some of the more high profile players available in previous years. I suspect the Seahawks will have players higher on their board (Upshaw?) – even despite the importance of the three-technique position. However, it’d surprise me if he wasn’t at least on Seattle’s radar as a possible target at #11 or #12. When I posted a critical view on Melvin Ingram last week, it instigated a heated debate as to whether he fits into Seattle’s scheme. Clearly, a lot of people out there like the guy enough to draft him with the #11 or #12 pick. I’m not one of those people, but so far it’s been a health discussion. By all accounts Ingram had a fine work out at the Senior Bowl and his stock is gaining momentum. I suspect he’ll get a sack or two in the game on Saturday. He’s a pin your ears back type of pass rusher, a guy who may be ineffective and even frustrating for three quarters of the game but will then makes a sack or two late on. While the Seahawks want to improve their largely anaemic pass rush, I can only see Ingram in a diluted role. Seattle has only one reliable pass rusher who has performed consistently well in the last two years and that’s Chris Clemons. While he is a free agent in 2013 and already 30-years-old, finding a long term replacement is not an absolute necessity at this point. The Seahawks need to find a compliment to Clemons, not a replacement. Pete Carroll testified in his end of season press conference that he wants to spend his first round pick on someone who is a constant contributor right away. Ingram’s role in year one (and maybe year two) would be to replace Raheem Brock on obvious passing downs and maybe kick inside occasionally (also in 3rd and long situations). You’re also banking on Clemons digressing in 2012, because if he records double-digit sacks again in 2012 I’m not sure you chase him out of town just because he’s turned 31. After all, Jared Allen is only a few months younger than Clemons. I highlighted Courtney Upshaw yesterday as someone who could be a better fit given the circumstances. He has superb recognition skills, he’s a contributing force against the run and will be able to rush the passer in a lot of different packages. Drafting Upshaw would essentially push Seattle’s hybrid defense closer to the 3-4 on certain downs than the current 4-3. It’s still largely the same ideology with the same personnel on the field – but with Upshaw at WLB yet playing a lot of downs at the LOS across from Clemons. This would give the team a lot more balance in terms of a pass rush, while also improving the teams run defense. It’s not impossible for Ingram to play a similar role but Upshaw is vastly superior defending the run (perhaps the key identity for this defense), he’s harder to move, he has the ability to read and react with superb pursuit and he has greater experience on underneath coverage. Ingram is a better speed pass rusher, but I think the other qualities are strong enough to separate the two in terms of what the Seahawks are looking for with the #11 or #12 pick. Ingram is a fun player to watch, but I also think he’s a little overrated. Below you’ll find a breakdown of the Nebraska tape (see video above) and he’s largely ineffective for most of the game. Upshaw is a master of leverage – he’ll get under the pad level and drive you backwards with a superb bull rush. He has violent hands and does a great job keeping lineman off his frame. Ingram might be a more athletic player in terms of foot speed and mobility, but he’s far too upright and when a tackle or interior lineman gets underneath his pad level, it’s over. Look how many times Nebraska’s #50 gets into his body and dominates Ingram. He had no answer against the left tackle – he couldn’t beat him on the edge for speed. If he engaged he couldn’t get off the block, he couldn’t bull rush the guy. You see in the video at the end of the game how he almost takes himself out of the play by standing off the tackle as if he’s saying, ‘I can’t beat you – I’m trying to work out why.’ South Carolina’s staff pretty much moved him permanently into the middle on a three man front because he had no success off the edge. As an interior rusher he didn’t achieve a great deal more and couldn’t get away from the center/guard double teams – often being stoned at the LOS. You could argue he was a liability against the run overall. He had one productive play on a spin move and you have to give him credit for having mastered that one move. When I interviewed Hall of Famer Richard Dent last year I asked him what young defensive lineman should do when approaching the league. Dent believed young lineman should concentrate on having one move you can perfect, that you can keep going back to even on a rough day. Ingram has that in his locker. He’s also a very busy, compact player who will get sacks at the next level. The thing is, I’m not convinced he’ll ever be more than a specialist rusher who ends up getting his production on third down. Let’s not forget – even as a fourth year junior that’s the role he had with the Gamecocks, before taking on more snaps as a fifth year senior. There’s some value to that, of course there is (see: Aldon Smith), but I’m looking at Green Bay who struggled on third downs most of the year and need a boost to compliment an elite roster. I’m looking at Baltimore who could add another piece to their elite defense. The Seahawks – as much as the defense has grown in the last 24 months – need more than a specialist. San Francisco spelled Aldon Smith because they already had guys like Justin Smith on the roster. Seattle needs a cornerstone – not a younger version of the 2010 Raheem Brock. 0:21 – Ineffective rush, too easily pushed over by the left tackle and Taylor Martinez has a clean pocket to throw a touchdown. 0:27 – Blocked out of the play by the right tackle. Doesn’t show enough drive to push the blocker backwards and once he’s allowed hands onto his frame, he can’t get free. 0:32 – Not sure what the plan was here, he shows inside but the tackle forces him to the outside. Again, once he’s allowed the tackle to get hands on his frame, he can’t disengage. 0:47 – Driven outside by the right tackle and as with 0:21, loses his footing. 0:54– Double teamed by the running back and full back as the tackle dips inside. Cornerback blitz isn’t picked up and leads to a sack, but Ingram is ineffective. 1:00 – Cannot disengage again, is too upright and doesn’t drive into the blocker. Dominated by the left tackle here. 1:08 – Three man front, Ingram is completely stoned by the guard and center working together. The rest of the defensive line and a blitzing linebacker get into the backfield, but Ingram struggles against the double team and remains at the LOS. To his credit, he sticks with the play and completes the tackle that stops the screen pass. 1:18 – Jarred at the LOS by the tight end who jabs at Ingram and then runs into space. It’s enough to take him out of the play. Ingram has to take advantage when lined up with a tight end. 2:10 – Again far too upright and allows the blocker to get into his pads and drive him out of this run play. The left tackle chirps away at the end of the play because so far, he has Ingram’s number. Playing at 6-2 and with a squat frame he has to do a better job with leverage. 2:30 – Superb pass protection again from the left tackle, dropping back and again getting hands on Ingram to basically finish the block. Perfect protection leads to a big pass completion from the quarterback. 2:46 – Does a better job against the tight end this time, dipping inside and then spinning out of the block to stop Martinez on the run option. Nice move. 3:01 – Again struggles playing inside against the guard and center. He doesn’t have enough power at the P.O.A. to drive through this situation and working against interior double teams he struggles badly. He’s the one defensive lineman stuck at the LOS while the others rush. 3:22 – Handled by the left tackle. Does a better job getting hands on the blocker and forcing him back a little, but he doesn’t beat the guy to press the quarterback. 3:30 – Kicks inside and is driven backwards by the interior lineman on this running play. Nebraska ran the ball right in his direction and he’s forced back several yards. 3:48– Left tackle seals the edge and this could’ve been kicked outside for a big gain. Ingram once again ineffective. 4:23 – Struggles badly – once again – when moved inside and defending the run. He cannot get away from interior double teams and it creates a huge hole for Martinez to run through the middle. 4:38 – Clear evidence that Ingram is struggling because he’s tentative to attack the left tackle here and basically takes himself out of the play. He’s over thinking the rush and trying to find out how he can beat the guy. 4:50 – The first evidence of an effective rush from a three-man front, where he uses his favorite spin move to get away from the left guard and force some pressure. Martinez sacks himself after the initial rush from Taylor, but Ingram was also closing in. 5:06 – Suddenly he’s on a role, abusing the center again from a three man front to record the sack. The interior lineman is outclassed here by Ingram and has no chance. 5:20 – Yet… when Nebraska go back to double teaming the interior, they take Ingram out of the play. 5:28 – Tries to rush the interior again but the spin move doesn’t work this time and he’s stopped at the line and jolted well out of the play. Seahawks showing interest in Courtney Upshaw? It’s not beyond the realms of possibility that this story is true, given that it’s totally believable that a.) Carroll was shooting some hoops and b.) he didn’t sprint out of the building at the prospect of communicating with a member of the public. Even so, I’ll leave it up to you to decide whether there’s any truth to this. 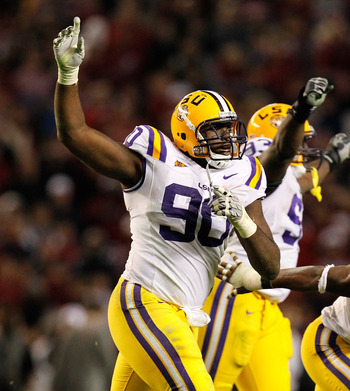 I felt obliged last night to go back and review some Alabama tape, so I skimmed through the game against Auburn last year and the two most recent meetings against LSU. My opinion on Upshaw has shifted several times, initially from one of disinterest because I couldn’t logically place him in Seattle’s defense. I became more intrigued when watching the Florida game this season where he stood out and then watched him closely against Arkansas, Auburn and those two games against LSU. After further review, I felt confident enough to make Upshaw the one player I’ve mocked to the Seahawks on multiple occasions. Even so, I still couldn’t place exactly what his best position was. Is he a 4-3 left end? A 3-4 OLB? Can he logically move to outside backer in a 4-3 with a lot of rush duties similar to Von Miller? I’ve charted every play he had an impact in for the three games I watched last night – and I’ve come away convinced he’s going to be an early pick. In a season without a lot of elite defensive talent, someone is going to draft this guy at the top of round one. In my most recent mock I projected he could go #8 overall to Miami to play OLB, so I was slightly surprised to see their announcement today that they’ll switch to a 4-3. That shouldn’t exclude Upshaw from being an option for the Dolphins, who suddenly have to find a 4-3 edge rusher as a main priority. I wonder if they have the cash to compete in the Mario Williams sweepstakes? If the Dolphins don’t take Upshaw, then Buffalo (also possibly moving to a 4-3) and Kansas City could show real interest. Being the #11 or #12 pick should be his floor. Here’s what I saw on tape and why I think he’s a real option as a pass-rushing linebacker for the Seahawks. For starters, his recognition skills are elite. In the two meetings with LSU and Cam Newton/Auburn, he came up against a lot of run-option. Not only did he show top-end instinct to react to the ball carrier, he also consistently drew the quarterback on the pitch and then adjusted to the runner – essentially taking both opponents out of the play. You see real awarness and athleticism when he tackles the pitch and I’ve not seen anyone comparable with Upshaw here. He showed fantastic awareness to react to screens and reverses and while he’s not an elite athlete, his pursuit skills more than make up for it. It’s incredible how often when teams tried reverse plays and other gimmicks it was Upshaw making the tackle. He’s only 6-1 and around 270lbs, so he’s not got the ideal length for an edge rusher. However, the guy just ‘gets‘ leverage. He will consistently attack a lineman with great pad level and drive players into the backfield. He has a deceptive second effort when trying to beat blocks, dropping a shoulder and seemingly giving the impression he’s beaten before bursting by a tackle to make the play. He’ll disengage with violent hands and rarely gets absorbed by even the biggest lineman. Despite not having the longest arms, he does a fine job keeping blockers away from his body so that he’s able to dip inside or burst around the edge. Upshaw’s thick set is comparable to a small three-technique and he has similar skills. He’s never likely to move inside at his size, but it’s funny how the hand use, the bubble and the strength are all comparable to an interior lineman. The guy bull rushes like he was born in Pamplona. For a team like Seattle that wants to shut down an opponents runing game, Upshaw is going to make it really difficult to run on the left side when he’s placed next to Red Bryant. Perhaps even more of an advantage though is the ability to spell Bryant a little more and maybe even kick him inside, knowing you can use Upshaw as a pure power end on more orthodox four-man sets. As great as Bryant has been for this team the last two years, there’s going to be big advantages on first and second down when the defense is able to press from both sides. At linebacker you’ll be giving up some coverage ability because he’s never going to be able to stick with top-end slot receivers and tight ends (he worked predominantly on underneath coverage at Alabama) but the WILL position is designed to be more of an attacking threat. Seattle has enough range at the SAM and MIKE (if they keep Hawthorne) to accommodate a player like Upshaw. In those sets the defense will have more of a 3-4 feel to it, but that’s not such a bad thing as discussed earlier this week. I also see Upshaw as the kind of guy who will make 4-5 key plays in a season. Not big plays, key plays. Whether that’s a crucial interception to end the game, a sack or a forced fumble – there will be a handful of games at the end of the year where people are talking about Courtney Upshaw’s performance on the ride home. And hey – the Seahawks are building a defense that is filled with attitude. Upshaw wouldn’t just fit into the brooding attitude that’s already part of this team, he’d take it a stage further. There aren’t a lot of stand-out defensive options for the Seahawks in this class. I like both Devon Still and Michael Brockers, but I’m not convinced either are the missing three-technique this team is looking for. Drafting a guy like Upshaw will improve the front seven as Pete Carroll is planning. You’re getting an 8-10 sack guy who can become a focal point on the defense for the next ten years. He’ll be the kind of player that is permanently talked about as ‘under rated’, when people suddenly realise they talk about him so much that couldn’t possibly be the case. People have compared him to LaMarr Woodley – I’m not sure he’ll bring the same rush impact as Woodley in Pittsburgh (positions and duties will be different), but his all-round influence could certainly be similar. What’s more, the guy is used to high standards at Alabama. He’s used to winning. That’s not a bad thing to have on a growing defense that has already achieved quite a lot given it’s starting point in 2010. Last year I argued – quite strongly – against Von Miller being a top-five pick. This wasn’t because I didn’t think he had elite speed and a very attractive skill set – I often remarked that he was the defensive player I’ve enjoyed watching the most in the last few years of writing this blog. My concern was his likely transition to linebacker, that he would have to adapt to different responsibilities and that could ultimately limit what he does best – rush the passer. His size made it unlikely he would play permanently at the LOS, so would he be able to have the same impact at OLB in a 4-3? I’m always happy to admit when I’ve made a bad call and kudos to Denver and Miller for making it work. The biggest concern I have for Upshaw is being able to make the same move, to the same position and role. Yet this is all about a learning process and acknowledging when you’ve made a mistake. Having misjudged Von Miller’s potential impact, perhaps Upshaw deserves a greater investment of faith this time? It would not surprise me at all if those internet rumors prove to be true and that Upshaw is near the top of Seattle’s board. He should be, possibly right behind the top two quarterbacks considering they don’t need a left tackle or running back (if they re-sign Marshawn Lynch). The only question is whether he’ll still be on the board at #11 or #12. I suspect not. If he is, then you could be looking at the next big piece in Seattle’s defense. Regulars will know the score by now. The idea of these weekly mocks is not to make a firm prediction as to what will happen on April 26th, rather it’s an opportunity to look at possibilities and talk about several different options. A lot of people are going to scratch their head at this week’s pick for Seattle, but I’ll try to explain. Firstly, I suspect the Seahawks will draft for defense in round one. It appears the only situation I can see where they deviate from this plan is if someone makes a surprising fall or having studied Brock Osweiler since his shock decision to declare, they believe he’s worthy of a top-15 grade. If neither of those situations materialise, then even with a mediocre defensive class I think that’s the direction they’ll go. Pete Carroll has been fairly open about where he needs improvement and the way he highlighted greater speed among the front seven, I think that was a big hint as to what the Seahawks might do in round one. He also mentioned other areas, such as wanting greater depth at cornerback and a ‘touchdown maker’ on offense if one was available. Even so, adding to the front seven makes a lot of sense given the team’s glaring lack of pass rush during the last two years and the seemingly total reliance on Chris Clemons to create pressure. They need more edge speed at linebacker and players that can cause greater issues on the blitz. They need a dynamic three-technique among the interior. They need at least one more complimentary edge rusher to replace Raheem Brock on third downs and obvious passing situations. When compiling this latest mock, I considered a number of prospects – some more obvious than others. Dre Kirkpatrick (CB, Alabama) has the kind of size this front office has looked for at corner and he grades very highly in run support. However, his technique in press coverage is poor and I’ll never forget the way he was abused by Ryan Mallett (understandable) and John Brantley (more concerning) where his weaknesses as a cover corner were exploited. He’s too stiff, he often plays the man rather than the ball and generally I think he’s pretty overrated. I understand why people want to avoid the cornerback position this early, because the Seahawks uncovered two new starters this year in Brandon Browner and Richard Sherman. It’s worth noting, however, the injuries Seattle sustained at the position last year and the likely departure of Marcus Trufant. Browner will be 28-years-old when the 2012 season begins and we saw with Mike Williams how a player can regress slightly after appearing from nowhere. Let’s not forget that according to PFP, Browner gave up the 7th most passing yards in the NFL. Carroll wants competition and the attitude among the secondary is having a huge impact on the defense. Adding another young prospect who can further add to the team’s identity might be high on the agenda, especially if they value Kirkpatrick as high as a lot of other people do. I also looked at Devon Still (DT, Penn State), Zach Brown (LB, North Carolina), Whitney Mercilus (DE, Illinois) and Melvin Ingram (DE, South Carolina). Still showed flashes of excellence last year, but I’m not convinced he’s a consistent interior penetrater who can provide the missing piece at three-technique. It may be that he’s valued more by teams looking to move him to the five-tech, although I paired him with Philadelphia (a 4-3 team) in this mock. Brown is definitely an option for the Seahawks, offering pure athleticism at linebacker and an ability to move from sideline-to-sideline making plays. Mercilus remains a bit of a mystery having had the chance to study his UCLA tape this week and I don’t expect the team to draft a LEO specialist in round one this year. Ingram causes a lot of heated debate on this blog, I stil maintain that finding a home for him in this scheme is a dilemma I cannot solve. So this brought me to a new direction, a player I’ve always been fond of but didn’t expect to get first round consideration due to a lack of size. A significant lack of size. Sean Spence is 5-11 and 228lbs according to the Senior Bowl numbers posted by Tony Pauline. In truth, he probably played most of his career at Miami closer to 220lbs. He’s basically a strong safety playing at linebacker, but it’s what Spence achieved in spite of his size that intrigues me for Seattle – even in round one. The Seahawks are looking for speed at linebacker, but not the kind of speed that Aaron Curry brings to the table. They want a guy who’s capable of blitzing sharply into the backfield and making a splash play, but they also want someone with the recognition skills, coverage ability and discipline to be more than a reckless heat-seeking missile who makes costly decisions. There are obvious limitations due to the lack of size and although Spence is generally a sharp tackler in the open field, he’s also had a few missed opportunities because he has such a modest frame. If he was asked to play the SAM I think he’d struggle taking on bigger tight ends in coverage, but the WILL places most emphasis on speed and being able to react to different situations. The way the Seahawks stack up their front line with size (Bryant, Mebane and Branch) may afford for a slightly smaller yet faster linebacker. A further way to compensate could be to build up the size at the MIKE, potentially by signing someone in the mould of Dont’a Hightower to provide that real menacing brutality and run support. He does get engulfed sometimes by bigger lineman, but his speed will be a big factor when blitzing and he’s tougher than the 5-11 frame suggests. He’s one of the best coverage linebackers I’ve scouted. Russ Lande at the Sporting News gave me the confidence to make this projection when he made Spence a first round pick in his latest mock. He also named him, “The best linebacker to come out of Miami since Ray Lewis.” Here are some of the post-Lewis linebackers to leave Miami and join the NFL: Dan Morgan, Jonathan Vilma, DJ Williams, Rocky McIntosh, Jon Beason and Tavares Gooden. Indeed Vilma has comparable size (two inches taller, but the same weight) and ran a 4.54 at the combine. Spence should top that. I asked Lande for further information given the high praise and he told me he believed Spence was an “elite” linebacker prospect with the ability to play the WILL or even the MIKE in the 4-3. There’s absolutely no doubt that this would be an unorthodox pick and one that would probably come with widespread criticism from the rest of the league. Yet Seattle’s front office has been anything but conventional so far and to a large extent it’s worked. If they were just looking for big, fast players – Aaron Curry would still be on the roster. Very few people expected James Carpenter to be a first round pick, while the likes of Kris Durham and KJ Wright where considered suprising selections at the time. They’re looking for difference makers, impact players, guys who will buy into the system and lead by example. Quite aside from Spence’s athletic qualities, he’s also been the heartbeat of Miami’s defense for a few years. Reports say he’s a coaches dream off the field – dedicated to his craft, a film room junkie and a student of the game. The Colts are cleaning house to make room for the Andrew Luck era. They might as well start talking about a contract now. The Rams have to take Kalil, he’s too good to pass up. There’s enough depth at receiver to wait until round two. Minnesota need to protect their investment in Christian Ponder. They’d love to have Kalil, but Reiff is a decent compromise. I’m still not completely convinced by this, but Cleveland does need a dynamic playmaker on offense. Sure, they have big needs at linebacker and corner. However, Richardson is an elite prospect who will transform an offense. Corner’s traditionally don’t go in the top-five and Patrick Peterson was the exception last year. Claiborne would be a nice get for the Jags. Miami needs an outside linebacker and Upshaw is doing enough at the Senior Bowl to warrant this kind of projection. A complete lack of defensive line talent could push a raw youngster like Brockers into this range. 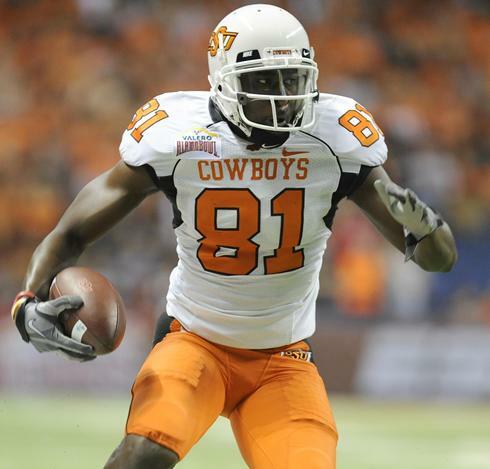 The Bills need to boost both lines and could consider Justin Blackmon too. However, taking Martin would be a smart move. I’m not a huge fan based on the tape, but he’s doing as much as anyone to promote his stock in Mobile. A titanic reach? Or just what the Seahawks are looking for? More speed in the front seven is the aim and Spence could be the ideal WILL. Someone is going to fall in love with this guy’s skill set. Arizona should dump Kevin Kolb and draft Osweiler. Elite coverage skills, the concern comes with the off-field issues. He needs to prove to team’s he’s matured in the last 12 months. The Eagles need a linebacker, but Andy Reid hates spending early picks on the position. Still could be an option here. Incredible production in college but has much changed in 12 months when he would’ve likely been a mid-to-late first rounder? Slightly over rated, a technician who looks great on the move but lacks elite power at the point of attack. The best receiver in this class as far as I’m concerned. He could end up being the complete package and a sound replacement for Vincent Jackson. Electric receiver who would quickly become Jay Cutler’s BFF. Capable of having a big impact quickly. They need to improve their edge rush and Mercilus led the nation in 2011 for sacks. A hard player to work out. Over rated corner who’s great in run support but struggles with press coverage. Not as good as advertised. Cleveland needs to keep adding playmakers. Floyd has his issues, but put him on that offense with RGIII and it’ll be much improved. Athletic linebacker who moves well and could go higher than this. As with all the UNC seniors, his play dropped off towards the end the year. His 2011 performance warrants a higher pick, but positional value could lead to a slight fall. He’s under sized but what a tackler – he’ll get close to 100 tackles in year one. Has several limitations. The Texans might struggle to re-sign Mario Williams, so could look elsewhere for further additions to their growing defense. Top end interior lineman who could be the best in this class. Stuck out on a talented Badgers line and no surprise he turned pro. He’s a tweaner who best suits playing off the edge in the 3-4. This would be a good fit. Sanu can line up anywhere and make plays. San Francisco use a lot of gimmicks and need a sure-handed catcher. In recent years Baltimore have capitalised on players falling into this range to get value. Coples could drop into the late first. Big, brutal linebacker who eats up run plays. Would be a great addition to New York’s defense. He plays like a runaway train – unbalanced, a bit out of control, yet with plenty of power and speed. Kirk Cousins – future Seahawks quarterback? Scott Enyeart added to the intrigue yesterday, tweeting: “(Pete) Carroll has been evaluating Kirk Cousins since this summer at the Elite 11 camp in Malibu, where Kirk was a counselor.” Clearly this is a quarterback we need to monitor during the next few weeks and certainly he appears to be on Seattle’s radar. “He is a guy who just finds a way to win. Never been the biggest, fastest, strongest at any point in his career, but still made the most of everything he can do. He commands the offense well and is a good field general. I’ve heard his teammates say when he speaks in the huddle there is just a great level of certainty and confidence and trust. As for his skill set, nothing jumps out at you really. But he does just about everything well. His arm strength is really good (not elite, but above average), he can thread the needle well and does so with confidence (especially this season). He has decent mobility, but does not often pull the ball down and run. He has nice straight-line speed, isn’t going to cut and stiff arm or anything to break for huge yardage. I can recall a couple of 20-yard runs in his career. Although I never much rated Kolb, I was surprised how little success he had in Arizona throwing to Larry Fitzgerald. I watched the Cardinals three times this year and noticed a common trait within Kolb’s play – his tendency to check-down too often and avoid risk despite having an elite receiver who consistently bails out the quarterback. He’s always shown a tentative streak as evidenced in this edition of NFL Playbook from 2o10, but that’s where Cousins differs. Thankfully, he’s willing to take a few more risks and he’ll need to if he’s to succeed where Kolb has failed so far in fleeting starting opportunities. At the same time – as I’ll discuss in the tape breakdown later – there are certain throws Cousins needs to learn to avoid. 0:01 – Good, sharp drop-back, identifies his target quickly and delivers the ball for a first down. 0:08– Effortless deep throw, precision delivery in behind a defensive back allowing the receiver to make a play in stride. Such a difficult throw to defend and the kind Seattle wants to use. Technique here is fundamentally sound, throws off the front foot and a nice spiral. Impressive. 0:24 – Another crisp drop-back, make a good read and delivers a nice pass to the right sideline. 0:45 – Excellent play fake executed to perfection and although the deep pass is relatively simple, he doesn’t throw it too conservatively allowing the receiver to continue moving and complete the score. 1:33– A lot of this touchdown is down to the work of Keshawn Martin (a senior receiver worth keeping an eye on) but Cousins does a great job identifying the coverage and purposely throwing high to make sure only the receiver can make a play. A necessary adjustment and good instincts and feel for the position. 2:16– This isn’t a good pass, thrown dangerously behind the receiver and without much velocity. That throw has to be arrowed to the left shoulder, closer to the sideline. It’s not a difficult throw that demands a high degree of accuracy. This was a missed opportunity and almost led to a turnover. 3:23– Evidence of struggles vs interior pressure. I sense Cousins just throws this away, or at least throws high to avoid the turnover and make it difficult for anyone to grab in the end zone. He actually had a checkdown to the left but never looks in that direction, focusing entirely on the end zone. 3:28 – Inaccurate throw to the end zone. Really needed to get more air on the ball and direct it to the far right corner. This is too short and makes the receiver stop to jump for the ball, when a slightly deeper throw would’ve caught him in stride. 0:01 – Well executed play fake and a nice touch pass with a little more air to make the completion. 0:06 & 1:01– Evidence of greater confidence throwing over the middle. Cousins was a bit of a ‘sideline’ thrower in 2010, but these are the kind of throws he has to make at the next level. 0:21– Throws into a really tight window, but executes and hits the receiver on an inside slant. 0:44 – Cousins completely sells the toss, runs the bootleg to the right and hits the open receiver for a touchdown. It’s an easy throw, but only because of the perfect execution on the play fake. Nicely done. 1:22 – Similar throw to the play vs Indiana, the ball leaves the quarterbacks hands before the receiver cuts to the right – just excellent awareness and chemistry, plus good accuracy on the throw. 1:47 – I’m not entirely sure what to make of this throw. The read says triple coverage off the play action, but Cousins trusts his arm and makes the completion. It’s hard to be critical because it’s a big play, but quite risky at the same time. However, sometimes you have to back yourself and the receiver to make a play. 2:29 – The other side of the debate, as this time Cousins trusts his arm too much and gets picked off. That is NOT a pass that should be thrown. Cousins needs to identify the double coverage and the position of the safety who has leverage over the receiver. Get out of the call and live to fight another day. Bad decision. 2:47 – Better execution, putting enough height on the ball to make sure the defensive back wouldn’t get close to it, but also allowing the receiver to make a play. 4:41– Another bad read and should’ve been an interception. He needs to identify the position of the defender here to the left shoulder of the receiver, facing the quarterback. If he makes that throw, the defender is going to be able to make a play for the ball and cut off the route, while the receiver is always going to struggle to react. 0:24– Cousins gets a great block to keep this play alive, but what a throw to the back of the end zone for a touchdown. It’s a laser – superb arm strength, accuracy and he actually directs his receiver to the ball before throwing. 1:17 – Underrated throw that will impress pro-scouts. Flashes pro-drop back skills and the ability to look off to his right and snap back quickly to hit a short route to the right. Textbook quarterback play taking advantage of the deep coverage on 2nd and 17 to make a manageable third down. 1:41 – Needed to drill this pass to avoid it being cut off by a linebacker. Makes the completion and gets the first down. 2:45 & 5:44– Very fortunate to avoid turnovers here. A common occurrence appears to be the chances he takes on shorter routes that are almost cut off and returned for six. He needs to do a better job progressing from those reads and being a little more careful with the football. A serious concern, because it keeps flashing up on tape. 3:48– Just one of those things with the wet ball slipping out of his hands. Every quarterback will do this at some point in their career, but he should’ve covered the ball up when it was on the turf. 5:15 – Good initial footwork to extend the play but he has to hit the receiver in behind the defensive back. He snatched at the pass a little and rushed the throw, but he had the time and the positioning to make a higher, accurate delivery for a potential touchdown. 6:03– Superb throw under pressure (he was hit) and delivering the ball perfectly to the right sideline for a big gain. Excellent technique and placement to dissect the corner and safety – a difficult throw to make. 6:27 – Awful fade attempt basically tossed into the air for grabs and is deservedly intercepted. Cousins has to do better throwing the fade, it’s not good enough at the moment and needs work. Such a crucial throw at the next level that must be mastered. 7:38 – Great pump fake, but once the defensive back bites on the play he has to make that throw. Overshoots the intended receiver. 7:47– The worst throw and decision in any of the three games so far. Cousins just gets really sloppy here, dropping back and moving into space, before just aimlessly throwing the ball downfield straight to a defensive back. Why make that throw? Terrible decision and mistakes like that can be catastrophic in tight games. Kirk Cousins has a lot of the natural qualities the Seahawks are looking for in a quarterback. 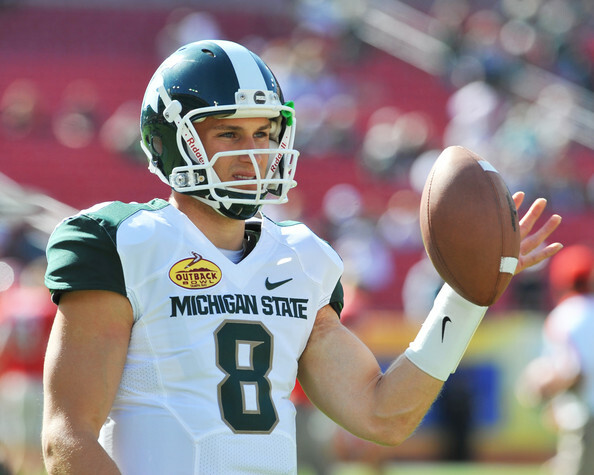 They want to run the ball and use play action – a major strength for Cousins having played in MSU’s heavy ground attack. He’s mobile enough to run bootleg’s and roll outs, while he also has the kind of arm strength the front office have looked for so far in acquiring Tarvaris Jackson, Charlie Whitehurst and Josh Portis. He’s the kind of individual teams want fronting their offense and with his technical experience in something akin to a pro-style concept, Cousins could even have a fairly reasonable impact early in his career. There are also limitations and areas for drastic improvement, particularly with decision making on shorter routes, learning to cope with inside pressure and trying to avoid throwing off the back-foot too often. The Seahawks seem unlikely to get their fix at quarterback in round one, but it’s almost certain they’ll eventually draft at least one player at the position in April. Cousins is being slightly underrated with some considering him merely as a late round option, but the Seahawks seemingly have enough interest and could take a look as early as round two – particularly if they are able to address a key defensive need in round one. Pete Carroll and John Schneider really keyed in on the offensive line last April, spending their first pick on right tackle James Carpenter and then drafting John Moffitt. Coupled with the 2010 addition of Russell Okung and the free agent signing of Robert Gallery, this was some makeover. As it happens, all suffered injuries last season but the line coped thanks to improved depth and the coaching influence of Tom Cable. A good running game was listed among Carroll’s main aim’s when appointed as Head Coach and I suspect the 2010 ‘performance’ was quite embarrassing given the emphasis it received. He’d witnessed the slightly farcical arrival and departure of Alex Gibbs, the consequent changes to the offensive staff at the end of the season and now the appointment of another big name with Cable. This justifiably needed to be put right and the 2011 results were in fairness a complete improvement. By the end of the season, the Seahawks were fielding one of the more effective run games in the NFL. Having gone some way to righting that ship, I suspect Carroll and John Schneider are going to similarly turn their attentions to the defense in a similar aggressive manner. The pass rush isn’t good enough at the moment and there’s way too much reliance on Chris Clemons for production. I have reservations about the scheme Seattle uses (more on that in a moment), but the simple fact is there’s not enough threat up-front to create consistent pressure. I can see a situating where the Seahawks jump into the draft really determined to go defense, maybe at the risk of forcing things a little. For all the coach talk that goes on at every franchise, Carroll has always been fairly honest with his assessments on improving the team. He clearly defined the offensive line as a target area twelve months before drafting Carpenter and Moffitt ago. This year he discussed the need for speed within the front seven and more sustained pressure to opposing quarterbacks. Aside from the gaping hole at quarterback (will this issue ever be solved properly?) improving the pass rush is easily Seattle’s #2 need. The problem is as I see it, this is NOTa strong draft for front seven pass rushers. It’s the weakest class of defensive lineman in years – Michael Brockers may be the best of the bunch, but further tape study has shown he may be better suited to the orthodox five-technique position – one not used in Seattle. Devon Still had a good 2011 season, but is he in a similar situation, facing a switch to the 5-tech? There’s no truly excellent defensive end who warrants a high pick and a pretty strong linebacker group has been decimated by underclassmen choosing to return to college. Zach Brown may be the only legitimate option at #11 or #12, but he only had 5.5 sacks as a senior and isn’t renowned for being a great pass rusher. Besides – how much of an impact can a WILL linebacker truly have for a teams lacking a consistent pass rush? Isn’t it more of a compliment than a solution? If the Seahawks are intending to use this draft to makeover the front seven, it just seems like a bad year to do it. Although I understand why they drafted Carpenter and Moffitt last April, they also passed on the following at #25: Jabaal Sheard, Muhammed Wilkerson, Brooks Reed, Da’Quan Bowers, Marvin Austin and Stephen Paea. All of those players could be better than the defensive options facing the Seahawks at #11 or #12 this year. 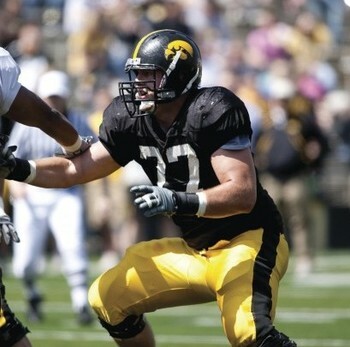 Meanwhile, as we approach the 2012 draft, Seattle might actually be in pole position to look at offensive lineman like Jonathan Martin and David DeCastro, while there could be some potential round two depth with Peter Konz, Jonathan Cooper, Cody Glenn and Kelechi Osemele. This is actually quite a decent year for interior line talent. I’m not trying to second-guess how the Seahawks are approaching things, I just hope the plan isn’t to fight the board for need. Clearly they had no idea what range they’d be picking in 12 months after the 2011 draft, or who would be available. The team had committed to a good running game and went out to get the pieces they need to install that. Now they’ve seemingly decided the pass rush needs the same treatment but in such a weak year for front-seven prospects, it’s difficult to get too excited about attacking that area of the team this off-season. Switching to the 3-4 an option? As I touched on earlier, I also have some concerns about Seattle’s defensive scheme and the way it appears to be heavily stacked in favor of run-defense. The scheme predominantly consists of three big defensive tackles who offer very little pass rush and one specialist DE who plays in space off the edge. In the current guise, I’m not sure how exactly the Seahawks intend to improve the pass rush. 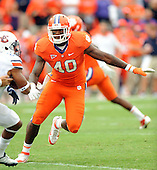 Are they looking to draft a truly exceptional WILL linebacker to balance things out across from Clemons? Zach Brown does a great job sideline-to-sideline and he’s a big time athlete, but he’s not a player built to be a consistent pass-rush threat off the edge. Trying to fit a guy like Melvin Ingram or Courtney Upshaw at the WILL doesn’t make much sense, given the position requires more than a passing degree of coverage skill, awareness, instinct and mobility. You really want those two guys getting after the quarterback, not dropping back to cover a tight end. They are two players that stood up at the LOS in college with great success, so asking them to play as deep as Leroy Hill did in 2011 would make little sense. I’m trying to work out just how committed the Seahawks are to the current incarnation of their defense. I sensed in 2010 they set the defense up mainly to max out what little talent they had and try to get at least some semblance of a competitive defense on the field. Without major investment during the last off-season, nothing much changed in terms of scheme or personnel, although they managed to uncover some young talent along the way. Do they move now to a pure 3-4? It would seem to make the most sense to me, especially considering what’s available in this draft. It would allow them to keep the big three along the interior, Clemons as a specialist rusher off the edge but provide another attacking threat on the opposite side. It’d take away some of the more extreme coverage issues in trying to fit college DE’s into the WILL. KJ Wright can play inside and a player like Dont’a Hightower could be had beyond round one to beef things up at ILB. That gives you the opportunity to target the players available in this class and use them in a more obvious way. Devon Still, Michael Brockers or Quinton Coples could play the orthodox five-tech, or you could look to draft Whitney Mercilus, Andre Branch or Courtney Upshaw (etc, etc) to feature at OLB. That to me would make a little more sense if you’re trying to improve the pass rush using this draft class, while maintaining most of the current starters on the roster. During the Jim Mora days (blergh) I used to argue against calls for a switch to the 3-4 because Seattle just didn’t have the size to make it work. That’s no longer so much of a problem and it’s something we have to consider if the Seahawks truly want to get this defense rolling. Yet this would be something of a departure for Pete Carroll, who’s pretty much incorporating the defense he used in Southern California. It was easier to recruit explosive, insanely talented linebackers than it is to draft them in the NFL. Without being able to go out and get the NFL version of the Brian Cushing, Clay Matthews and Rey Maualuga triumvirate, can the Seahawks find enough speed and talent in this draft class to make it work? I’m not totally convinced. The Senior Bowl is underway and I’d recommend following SI.com’s Tony Pauline’s updates as the week unfolds. So far it sounds like Ohio State lineman Mike Adams has impressed competing with Vinny Curry, but apparently it’s not been a good start for Boise State’s Kellen Moore: “Though its still early, Moore does not look good. He shows no ability to put speed on his passes and his throws have consistently been behind receivers.” Keep an eye out for the aforementioned Zach Brown of North Carolina, who has already been lining up in multiple positions including middle linebacker. If the Seahawks are really serious about spending a first round pick on the position, Brown has to be in with a shout. Mike Mayock is also at the Senior Bowl and has today been listing his positional rankings. Interestingly enough he doesn’t seem to be as high on Dre Kirkpatrick as most other people, placing him at #5 among corner’s. We’ve discussed a lot on this blog the overrated nature of Kirkpatrick’s game – he’s superb in run support and has the size to play a great physical game at the next level. Yet when it comes to coverage – the thing he’s going to need to do the most – Kirkpatrick just isn’t that good. Hallam also pointed out that Seahawks scouts spoke to Cousins and Moore after practise. It’s no real surprise, given that the Seahawks will surely draft a quarterback at some stage if they don’t address the position in round one. Cousins is one to watch and a player we’ll focus on later this week. He made significant strides in 2011 and has maybe flown a little under the radar. He could easily be the fourth best quarterback in this class after Luck, Griffin III and Osweiler. We’ll have more from the Senior Bowl later in the week and of course an updated mock on Wednesday as usual. Considering the defensive theme of today’s post, I’ve added a video of Whitney Mercilus (DE, Illinois) vs UCLA at the top courtesy of JMPasq.